In this issue of WHOTT Web News we take a brief look at our first rally at Westpoint, the VR life extension, and the Helston-The Lizard 100th anniversary. WHOTT Rally - On September 21st, WHOTT organised it first rally at the proposed museum site at Westpoint. More than 60 buses, coaches and commercial vehicles were on show and the event was attended by more that 1000 people. For this first rally, restored vehicles from Devon General were featured to mark the 40th anniversary of the first Devon General vehicle to be persevered. In addition, three newly restored vehicles, made their debut West Country appearance at the rally. 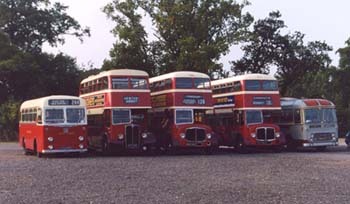 They were Western National Bristol VR 1121 (VDV 121S), Devon General AEC Regent V (TTT 781) and Devon General Olympian 1814 (A686 KDV). Click here to see more details of the event. Devon Generals mustering from North, South, East and West the evening before the rally at Westpoint. VR Life Extension - John Barley takes us through the history of 1121 (VDV 121S) which was delivered new to Western National in 1978. During her career she was mainly based in Cornwall. In 1995, 1121 was to received a full internal refurbishment, as were many others, this was to extend the life of the VR into the next century. John was informed that in early 2003 she was to be retired from service with First Western National. He approached FWN to arrange purchase for preservation and on the 16th June, 1121 started life in preservation. Over the following days, she started her long journey to her new home in Sussex, after completing several local routes. On the way to her new home she meet up in Yeovil garage with her sister vehicle 1122 (VDV 122S), which was probably the first time in 25 years that the two vehicles were together. 1121 has now been repainted in Western National NBC livery and attended the rally at Westpoint. The start of the long journey back to Sussex on 18th June. 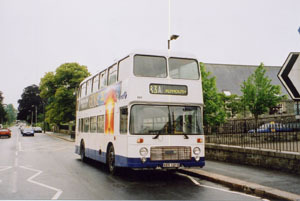 1121 pauses outside the 'new' bus station at Tavistock. 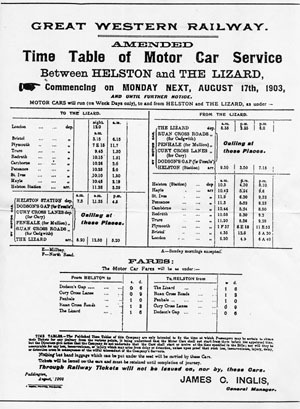 Helston-The Lizard - 100 years on.... - More than 30 buses and coaches assembled on the 17th August to celebrate 100 years, to the day, of the start of GWR services between Helston and The Lizard. Departing from Helston at 11:35, they arrived at The Lizard, England's most southerly bus terminus, about an hour later. VDV 141S was repainted in the old GWR livery. Already at The Lizard was the WHOTT Panther and Colin Billington's GWR Guy FBB Fleet No 1268 (YF 714) which is still undergoing restoration. FWN vehicles in commemorative livery together with incumbent operator Truronian's TT03 TRU, a new Transbus Dart SLF. 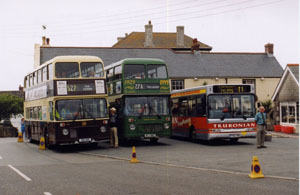 VR1003 (VDV 141S) in GWR livery shows Route 527 the number given in the 1969 renumbering, whereas 1141 (AFJ 706S) in traditional Tilling Green livery shows 27A, the previous number for the direct Helston-The Lizard service. W.J. Rich & Sons Scammel Crusaders OCY 873M and RPX 641M.